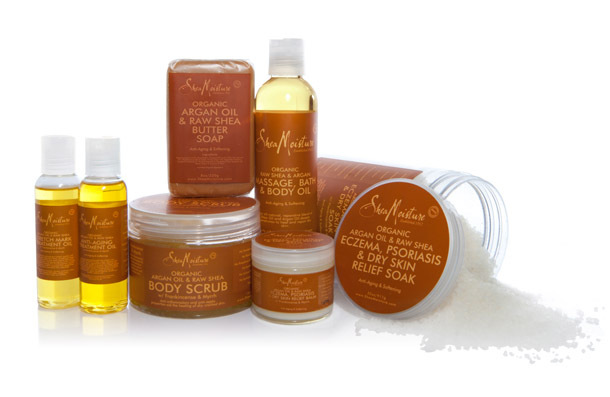 This collection is the ultimate treat of indulgence for your body. Not only do the products quench and nourish your skin but the healing shea, cocoa and mango butters hydrate and help repair damaged skin. My favorite products in this collection include the organic argan oil and raw shea body scrub, body wash, bath body & oil massage oil. The body scrub is a true sugar scrub that starts to melt right into the skin with a little warm water. As you rub the product into your skin it instantly smooths and hydrates your body. The smell of this scrub is also AMAZING! The frankincense & myrrh leaves you feeling super relaxed and rejuvenated. The body wash is soft and does not leave your skin feeling dry or stripped. It foams up to a great lather and gives a fresh clean sensation to the body. Lastly, the bath and body oil is a great product to apply directly after you rinse off the body wash while in the shower. This is a winter must have to prevent dry, cracked skin! It accelerates moisturazation and promotes healing with the raw shea butter and vitamin E-rich argan oil. All the products in this collection range from $4.99-$9.99 at Target. I am glad to catch idea from your article. I feel strongly about it and love learning more on this topic. Keep up the good work!